The Supreme Court in Axis bank vs. SBS Organics PrivateLimited held that the partial deposit before the Debt Recovery Appellate Tribunal (DRAT) as a pre-condition for considering the appeal on merits in terms of Section 18 of the Securitisation and Reconstruction of Financial Assets and Enforcement of Security Interest Act, 2002 (SARFAESI Act), is neither a secured asset, nor a secured debt, and hence refundable to the appellant on disposal of appeal. The Supreme Court held that Visvesvraya Technological University (VTU) , a University in Karnataka which exercises control over all Government and Private Engineering Colleges within the state, is not entitled to the benefit of exemption from Income Tax under Section 10(23C)(iiiab) of the Income Tax Act. A Two Judge Bench of Supreme Court just stayed the Uttarakhand High Court Order quashing President’s Rule in the State. The Court ordered that Centre shall not revoke Presidential proclamation till April 26th. The Supreme Court upheld the Government policy decision to pool the price of Re-Gasified Liquefied Natural Gas (RLNG). Apex Court bench comprising of Justices V. Gopala Gowda and U.U. Lalit dismissed the appeal filed by Essar Steel Ltd. against Gujarat High Court Judgment which also had upheld the policy decision of the Government. The Supreme Court directed the Director General of Civil Aviations to take immediate steps to ensure that there are sufficient flights from Delhi to Shimla. 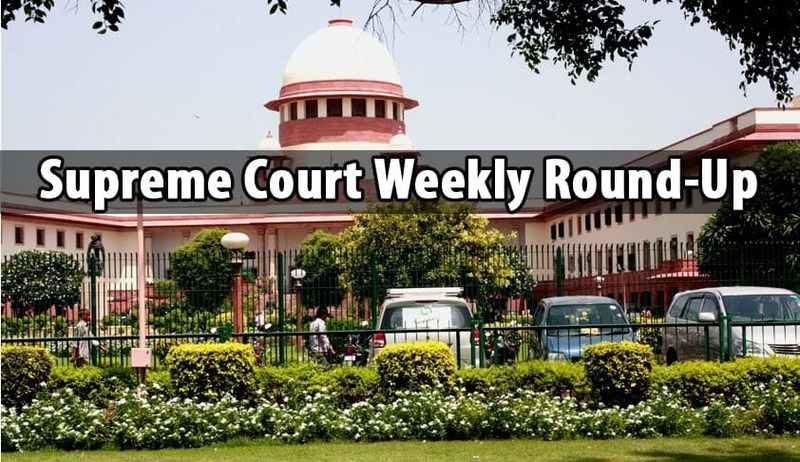 A bench comprising of Chief Justice T S Thakur, Justices U U Lalit and R Banumathi warned that it may be forced to pass specific orders if the directions were not complied with by May 4. “Sooner airlines start operating on Shimla route, better is for them”, the bench said. In a small but noteworthy order, the Supreme Court, expunging the adverse remarks in a High Court order against a District Judge, said that even a wrong order by a Judge should not be visited with adverse remarks against him. An Additional District Judge from Orissa had appealed against an order of High Court, praying for expunction of certain adverse observations made in it, by the High Court against him. The Supreme Court in Indrani Wahi vs. Registrar of Coop. Societies& Ors has held that that transfer of share or interest in a cooperative society, based on a nomination in favour of the nominee, is binding on the said society. Justices J.S. Khehar and C. Nagappan allowed the appeal filed by Indrani Wahi, and directed the society to transfer the share or interest of the society in her favour. The Supreme Court pulled up the states for not removing encroachments in public places like illegal religious structures and remarked that it is an insult to God to have them on roads and pavements obstructing people’s way The bench headed by Justice V Gopala Gowda and Justice Arun Mishra almost issued summons to Chief Secretaries to initiate contempt proceedings for not adhering to its order of 2006 and reiterated in 2013, but was prevented by lawyers of a various states who assured immediate action. They also promised speedy compliance and filing of status reports. Supreme Court of India dismissed an Application as withdrawn, filed by High Court of Kerala in Malik Mazhar Sultan & Anr. v. U.P. Public Service Commission, seeking permission to induct 66 Munsiff Magistrates Candidates who were selected and completed the pre-induction training, pursuant to an examination conducted in 2013, for the current vacancies. Describing a case as “classic example of the abuse of the judicial process by unscrupulous litigants with money power”, the Supreme Court imposed Rs. 25 Lakhs costs on each of the parties before it, as a compensation for the loss of judicial time of this country. The parties viz. Messer Griesham GmbH, Goyal Gases Ltd. And RUIAS(companies) were asked by the bench comprising of Justices J. Chelameswar and Abhay Manohar Sapre to pay the above said amount to National Legal Services Authority to utilize it to fund poor litigants to pursue their claims before this Court in deserving cases. Supreme Court observed that the Medical Council of India cannot be expected to approve an application submitted by an institution, for establishing new medical college, if the requisite ‘essentiality certificate’ submitted along with it, was defective. The Division Bench comprising of Justices Dipak Misra and Shiva Kirti Singh set aside the Kerala High Court order wherein it had directed Medical Council of India to take into consideration the revised Essentiality Certificate submitted by V.N. Public Health & Educational Trust along with their application to establish new medical college from the Academic year 2016-2017. Ban on entry or women cannot be bracketed with issues relating managing of religious affairs as gender equality is a constitutional message, the Supreme Court said on the contentious issue relating to Sabarimala shrine in Kerala. “Gender equality is a constitutional message and they (temple management) cannot say that this (banning women) comes under their right to manage religious affairs, a bench headed by Justice Dipak Misra said. The Supreme Court pulled up the Mumbai Police for not taking steps to open dance bars by issuing them licences as per its order six months back and also issuing a new controversial Act which imposed several more restrictions.